Magnetic Base Blocks & Micrometers are widely used in construction, industrial or metalworking projects. HSMAG’ bases blocks and micrometers come a wide array of designs to suit any application or project need. We also carry a non-magnetized Magnetic V Block, Magnetic Induction Block, which can be used in combination with a magnetic chuck to hold items that are difficult to hold without a chuck. Magnetic V-Holder has magnetic force,which can be used for holding tools for round bar marking,drilling,tapping and grinding of irregular-shaped worpieces,and holding tools for various measuring systems. The Micrometer Base is used to hold outside micrometer or other gauges with sufficient frame areas that can be held. The Magnetic Square Type Block is widely used in metalworking. These magnetic blocks have an On/Off switch and are available in many models of your choice. It has strong magnetism and clamping force for accurate measurements. The magnetic Push-Button Type Holder is widely used in commonly metalworking and other industrial projects. These magnetic blocks have an push-button On/Off switch and are available in many models of your choice. It has strong magnetism and clamping force for accurate measurements. 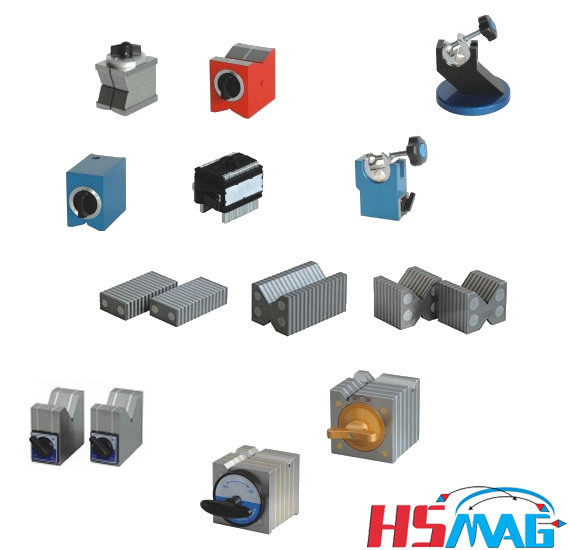 All of HSMAG’ s magnetic base blocks and micrometers contain magnets made with the strongest magnetic material, the rare earth metals neodymium (NdFeB) and samarium-cobalt (SmCo). When you use one of our high-quality products, you’re using one of the strongest, most durable and long-lasting magnetic product ever made. Whether you’re looking for quality Magnetic Stands, Holding Catching and Handle Magnets, or Permanent Magnets, you can find what you’re looking for at OUR WEBSITE.